The advent of the Goods & Service Tax, which has replaced the numerous indirect taxes levied, had brought with it a lot of chaos and confusions about how the new system will plan out. After facing the initial hiccups since its launch in July 2017, GST compliance has started picking up pace. That does not make it less confusing to file returns. According to the norms, any regular business must file GSTR1 and GSTR3B every month. This amounts to a whopping 24 returns in a year. Returns like GSTR2 and GSTR3 have still not come in practice due to the compliance challenges faced by the users. But there is good news. Your business need to not have any additional complications from filing returns. Input Tax Credit is something that keeps your life in balance, more so for SMEs. The availability of ITC could determine the cost of compliance and estimate the competitiveness of a business. ITC can be claimed on expenses incurred during ‘furtherance of business.’ SMEs can claim ITC across a lot of avenues if they’re familiar with the law, and thus reduce costs of operation. ITC (Input Tax Credit) can be claimed based on the GST returns submitted on the GST portal. Initially, it was thought to work after matching GSTR1 and GSTR2. But now, it works based on the GSTR1 and GSTR3B filed. However, the invoice records must be maintained meticulously to ensure proper entry at the time of return filing. GST is a step towards digitizing the entire Indian economy. The GSTN portal is the most used source for uploading all types of returns, verifying account balance and checking the ITC granted. Transcribing manual records onto a computer screen not only is taxing, it can also result in a costly mistake. Softwares for filing GST turn this entire process into a pleasant experience. Here’s the ultimate cheat: third party GST software for filing your returns. 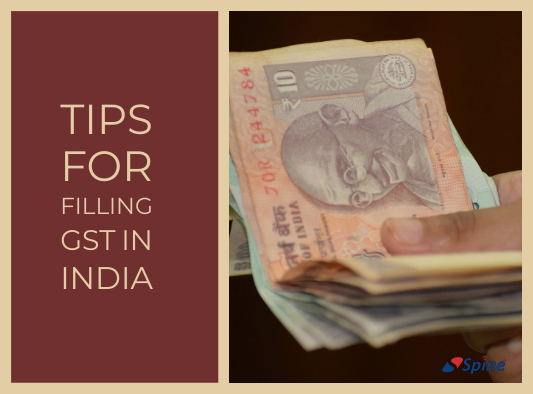 Of course, tax returns can be filed directly on the GSTN portal, but if you are not well-versed with the forms or the technical aspects of the entire situation, it is much more convenient to file taxes using a GST software. A GST software incorporates convenience and digitization into a single user-friendly experience. Usually, most businesses settle with a bookkeeping software that usually takes care of all the inventories, tax calculations, invoices, and bills. The introduction of GST software takes care of these technicalities. It makes the registration and migration of data extremely easy. GST software also simplify invoicing. Service based companies have to follow the tedious procedure of calculating taxes based on transactions and different items with varying rates. Filing returns with a GST software puts all of this on a computer screen with drag and drop ease of access. Customizability is another brilliant aspect of a GST software. It automates tax and other rates according to business processes. The user can customize the tax calculations based on their business requirements. There exist a lot of myriad taxes, using a software to file GST makes sure that all tax penalties are appropriately addressed. A GST software comes as a time-saving, cost effective measure that is practically error free. There is no threat of miscalculations or losing invoices. Filing taxes with a GST software can help manage all of the operations with ease. And finally, all your data is accessible anytime, anywhere. This is the main benefit of using a GST software. Data check, and verification, keeping track of cash flow, and real time payment analysis are all possible due to GST softwares moving the entire bookkeeping experience online. As with everything else, there is no one-size-fits-all best GST software. You have to decide according to your requirements, which would be the best GST software for you. While looking for a GST software consider the price, its unique features, advantages, and disadvantages. If possible, try various softwares before settling on your final choice. A few popular choices are Tally ERP, SpineTrader, Marg ERP, Zoho Books, Quick Books, Gen-GST, Sine Wave, and Clear Tax. GST has fixed a lot of problems with the original cascading system of indirect taxes levied on good and services. It has benefited logistics, regulated small businesses, reduced compliances, and is already benefiting small businesses. Filing returns on time, claiming proper ITCs, and keeping a record of all your transactions are all you need to keep on top of your tax game.